Celtic knots are ever popular in jewelry designs. 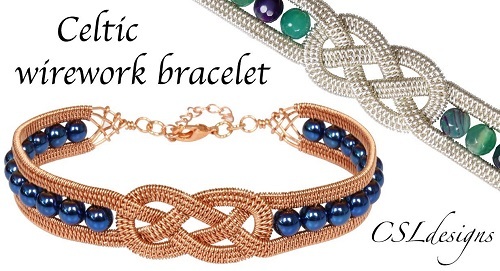 Check out these two awesome Celtic knot wire bracelet tutorials by two British instructors. This wire woven one is by Christina Larsen of CSLdesigns. As you can see from the tutorial, Christina bends two pairs of woven wire lengths into two. She then interlocks the U parts. Carefully. The trick with working with very soft wire is to work slowly so no undue bends and kinks are created. The colored beads are easily added after the interlocking is done and wire weaving proceeds along the straight bits. Lovely finish at the clasp ends. Not up to wire weaving? Check out Theresa of Lily-Tree's Celtic necklace tutorial. This is a very different look with no wire weaving. But 3 lengths of 18 G soft copper wire are manipulated together to form the knot. As with the previous tutorial, slow and easy does it is the trick to getting it right. This instructor also shares a Celtic knot element in the handmade clasp design. We tend to associate these types of decorative knots as Celtic used in Irish and Welsh Christian designs. However, "the use of interlace patterns had its origins in the artwork of the late Roman Empire." A very beautiful design. I don't do wire work but this one makes me want to try - think I'll view the tutorial. That double wire look is really impressive Pearl. People would always be trying to figure out how it was created! Interesting that you should showcase Cynthia'a Celtic Knot. The last assignment for my advanced kumihimo class was for them to construct the kumihimo Celtic Knot Bracelet. Cynthia is very talented, creative and always very original. If you want a stunning piece of kumihimo jewelry, look at her site first. Her youtube videos are excellently done and always helpful. Aside from your blog, her youtube site is my "go-to" source for new ideas. Thanks so much for confirming how good and helpful Cynthia is!! Love it.. Haven’t played with my wire (for wireworks sake) in a long time. I have 16 gauge round that jumped up from the table when I saw this Thanks so much!